Nokia Lumia 635, the big brother of Nokia Lumia 630 and younger brother of Lumia 930 comes bundled with some nice specifications. The handset is priced at $189 off contract and has 4G LTE support. More or Less the specs are similar to Lumia 630 and only thing that makes Nokia Lumia 635 apart from Lumia 630 is 4G LTE support. The LTE connectivity seems to be quite interesting at this low price point. 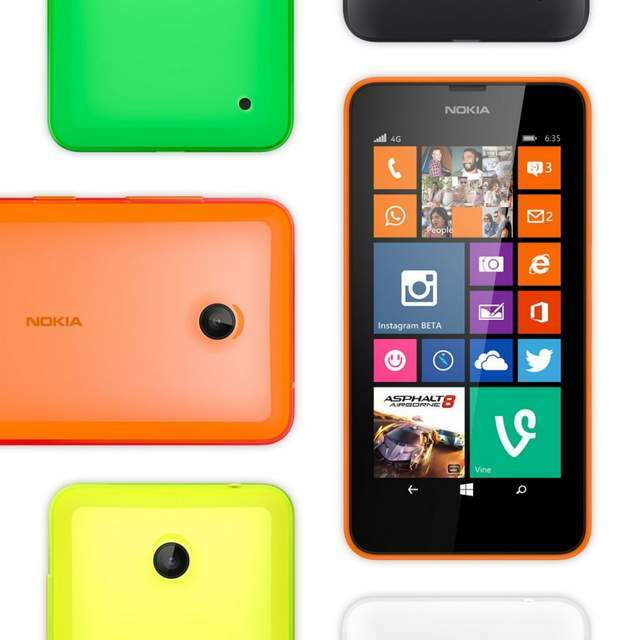 The Lumia 635 features a 4.5 inch FWVGA display with Gorilla Glass 3 protections and runs on windows Phone 8.1 operating system. Like other newly launched phones it also comes with on screen controllers ( inspired from android OS ). It gains the strength from 1.2 Ghz Snapdragon 400 CPU integrated with 512MB of low RAM. It has 5-megapixel auto focus primary shooter but lacks the Flash functionality. It houses 1830 mAh battery and offers 3G, BT 4.0, WIFi up to n, LTE and micro USB connectivity. It comes with replaceable shells in white, yellow , green, orange and black colors.